I went to Catholic grade school in a mostly Irish and Italian neighborhood. I carried a metal lunch box, painted to look like a barn. It had a Thermos made to resemble a silo. Carrying a barn-shaped lunch box was a huge source of embarrassment. My classmates had lunch boxes with Superman or Batman on them. Others were emblazoned with popular TV shows or cartoon characters. The coolest kids had race cars on theirs. Every year on St. Patrick's Day, my mother filled my lunch box with green food. My sandwich had lots of green lettuce and sardine salad with lots of green olives. Instead of potato chips, I had green celery sticks. My thermos was filled with milk that had been dyed green with food coloring. To this day, I remember the ridicule and humiliation I faced carrying my barn lunch box. It was only made worse as my classmates saw me with my green-themed food and milk. The Italian kids were especially tortuous. And to this day, I commemorate my mother's heritage by cooking an Irish-inspired menu on St. Patrick's Day. 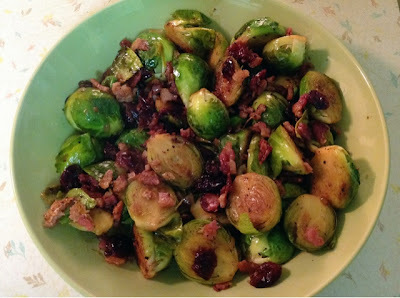 Though Brussels sprouts aren't really Irish, they are green and a lot better than boring, plain cabbage. This year I paired this recipe with dilled baby red potatoes and my must-have corned beef. While bacon cools, add Brussels sprouts to drippings in skillet; season with salt and pepper. Cook, stirring often, until well browned in spots and beginning to soften, 5-7 minutes. Reduce heat to low and add cranberries, shallot, and butter; cook, stirring often, until shallot is soft, about 3 minutes. Add broth to skillet; increase heat and bring to a boil, scraping up browned bits from bottom of pan. Reduce heat to medium-low and simmer until broth has evaporated, 1-2 minutes. Stir in vinegar and crumbled bacon. Season to taste with salt and pepper. I know for myself I have been in lifelong therapy over these school lunches, as well. Was it because of the use of wax paper instead of baggies? Please add on that this was the one day of the year Mimi was allowed to celebrate her heritage! She usually had a buzz on by the time dinner rolled around so there was an extra amount of green food color added to the mashed potatoes.